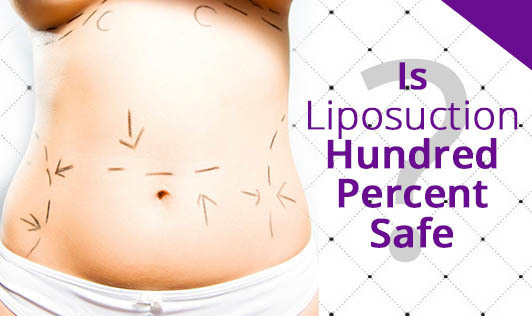 Is Liposuction Hundred Percent Safe? Liposuction is a cosmetic procedure that gives a psychological boost to the individual who is looking for a well shaped body. The most common areas for liposuction are abdomen, thighs, hips, chin and arms. It is considered to be fairly a safe and simple procedure if it's done by a qualified cosmetic surgeon, and if the patient is in good health. However, there are risks involved even in this simple process. If excess fat is removed from the body, 'dents' can be created in the skin instead of a rounded shape. Contour irregularities, allergic reactions, infection, fluid imbalance, damage of an internal organ are some of the risks one should be prepared for. These risks are apart from the side effects like pain, swelling, numbness, limited movement, etc. that can occur after the surgery. If you want to get a liposuction done, make sure you understand the pros and cons well before you take a decision.